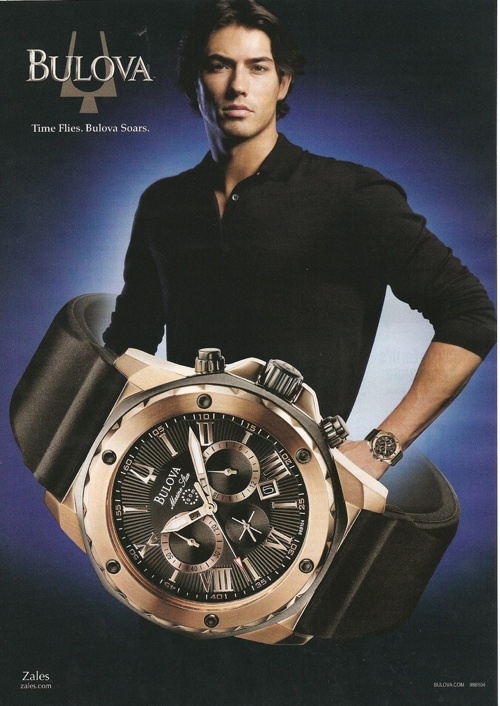 Wristwatch advertisements found in glossy magazines depict their male (and, in the case of tennis players like Maria Sharapova, female) subjects as modern samurai, of the type described in H.G. Wells's A Modern Utopia. The protagonist of that 1905 science-fiction novel describes "certain men and women of a distinctive costume and bearing" who constitute an austere order charged with directing world affairs from behind the scenes. The samurai, "with faces strengthened by discipline and touched with devotion," are doctors, lawyers, engineers, authors, and other accomplished men and women; they wear simple black clothes, and travel the world lightly. In ads for watches manufactured by Tag Heuer, Bulova, and Breitling, we find today's samurai posed in airports and lofts and streets that could be anywhere in the world; they are ready for whatever happens. Now comes a blog, Everyday Carry, dedicated to "a lifestyle, discipline, or philosophy of preparedness." 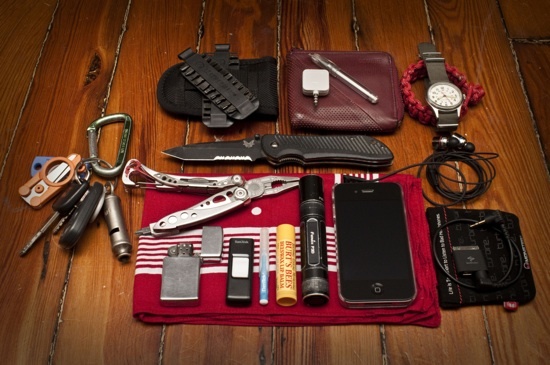 EDC's readers submit photos of those small items and gadgets which they wear or carry on daily basis, whether to manage common tasks or for use in emergency situations. The astonishing panoply of minitools, cameras, flashlights, pens, Blackberries, lighters, and (yes) wristwatches on display at EDC suggest that the samurai ideal (as lifestyle, though most likely not style of life) is very much alive today. Just don't try getting those knives through security, folks. British royal weddings, since the ill-starred Charles and Diana saga, have been understandably downbeat affairs. The return of the Diana factor this time around, at one step removed, has helped boost the ratings a little. Press, TV and the souvenirs business in particular are ramping up at least their own enthusiasm. Like anthropomorphic puppies anticipating a free lunch of Cesar, familiar TV news faces flushed with excitement display simpering smiles and faraway looks of infinite tenderness and solicitude. One suspects that any half-reputable lie detector test or MRI scan would reveal an aurora borealis of activity going on simultaneously in the most cynical and atavistically fearful, even desperate, regions of their collective brain. The best semiology, wrote Roland Barthes is also SEMIOCLASM. This means vigilance and resistance at every turn, breaking open mystifying language and imagery, refusing to let it function as it would wish – to slide past our critical faculties by appearing perfectly ‘natural’ and incontestable. If we believe that education can help people realise their potential and become smarter then it follows (any statement being logically meaningful only because it’s opposite means something different) that there are other activities that help make people more stupid. A random check on two UK primary school children nearby, thankfully, evokes the same one-word reaction to the royal wedding – “boring”. Then an elaboration from one of them: “but the teachers have to pretend to be interested”. For the millions of indifferent or slightly nauseous Brits (appreciative nevertheless of a day off work, even if it was Gaddafi coming to town to dance a jig with Tony Blair) award-winning journalist Johann Hari, in the linked article, semioclastically pinpoints who the real killjoys and betrayers of the national heritage are. (At the time of writing this introduction Google, with immaculate taste, is displaying ads for royal wedding memorabilia alongside the online version of the article). 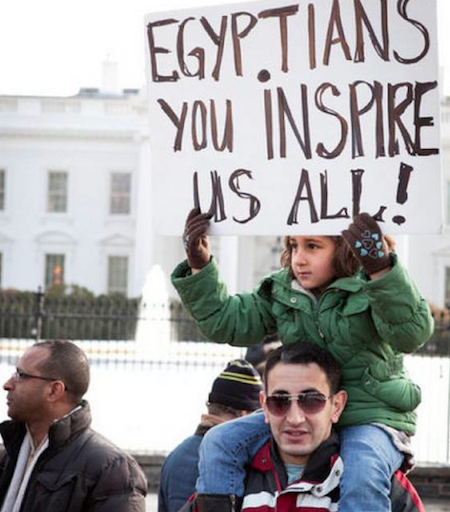 “Who’s afraid of Twitter?” asks an anti-Mubarak sign on a best-of-protest website, “Egypt you inspire us all” says another. Social and political change is in motion. Novel political placard ideas are evaluated online as if they were new ads or brand catchphrases. Brands repay the compliment. A model waves something like a burning draft card. This is John Frieda’s ‘Frizz Revolution’. We want anti-frizz serum and we want it now. More earnestly the UK Co-op’s website bids “Join the Revolution”, with social enterprise-style community projects and a retail offer ranging from ethical fish and fair trade chocolate to funerals. Backed by a history, since 1844, of “everyday people working together to build a business that would change the world”. After poll tax riots and no-logo marches in the past, protests against capitalism in general and bankers specifically, current public services cuts and increased educational fees in UK are contributing to a renewed culture of protest and dissent. Will media, from the BBC to Sky and News International, regard protest by what's called a new ‘lost generation’ at home as favourably as they have that in Tunisia, Egypt and Libya? How will these glimpses of activist or revolutionary codes in brand communications, echoing daringly engagé ads put out by the likes of Fuji Film and Benetton in the 90s, develop this time around? The World in 2011, The Economist’s look ahead for this year, predicted no serious disruption in Egypt or Libya (“Qaaddafi has held power for 40 years and will certainly complete 41 … he has removed all significant threats to his rule”). The prospects for UK, meanwhile, looked more problematic: “Deep austerity, the price for bank rescues and fiscal stimulus, will raise social tensions and spark industrial action”. But “a national sense of inevitability", the prediction continued, "means most will grin and bear it”. In December 2010 the UK media showed pictures of a horrified Prince of Wales and Duchess of Cornwall (AKA Charles and Camilla) cowering behind the windscreen of their Rolls Royce as protestors approached chanting, according to the Daily Telegraph, "Off with their heads!". In true press parlance and unlike their counterparts in North Africa, these protestors were characterised as a 'mob'. Evidently an ironically detached and, in typical English style, good-humoured mob if the chant's intertextual evoking of Alice in Wonderland is anything to go by. Anyone intent on more serious damage or cutting closer to the royal bone would have opted for "Remember the Romanovs". But by April 2011 with a Royal Wedding impending and the prospect of streets joyfully thronged rather than unrulily mobbed these dark concerns are at least momentarily behind us. And the spark from North Africa could yet jump to Europe. In what form, who can guess? Portugal’s entry for the Eurovision Song Contest, to be held on May 10th this year, is ‘A luta é alegria’ (The struggle is joy) which won on the popular telephone vote after being unanimously rejected by the TV expert panel. Performed by motley collective Homens de la Luta (People of the Struggle) this invokes for today the spirit of the Summer of ’68. In Ireland, like Portugal and in its own way UK a serious casualty of the crisis, there are variously calls to go back and reconfigure the Republic along the lines of the socialist principles some of the founders advocated back in 1921 and – at the other end of the radical spectrum – iconoclastic cultural productions from the likes of Limerick's hit band Rubber Bandits, who take punk bad taste to transcendent levels of carnivalesque awfulness (with possibly unwelcome product placement for Mitsubishi and the Honda Civic). However this pans out there are clearly alternatives around to grinning and bearing it. Commercial semioticians have been busy in recent years helping brands understand how they might engage with a now long list of concerns that emerged and were beyond the horizons marketers and corporations had been traditionally concerned with: social responsibility, fair trade, sustainability, co-creation and the power of social networks – now the aftermath of severe financial crisis and spending cuts. In UK specifically there is today a lower prospect of children moving during their lifetime out of the social class they were born into than has existed since before the 1960s. Which might indicate to a neutral observer either a major systemic flaw or the existence of some kind of self-perpetuating elite with its own segregated health and education services and an indifference to democratic opportunities except the narrowest and most technical sense. At which I hear a baying mob of media types nearing the street below my window chanting "political correctness gone mad!". We eagerly await the summer of 2011. No predictions. But in UK we always think it's nice if it's long and hot. (If you take nothing else out of this piece do check out the link to the Rubber Bandits video clip for 'Horse Outside' (be warned it's catchy, you won't stop singing it in your head for 4 months) but I'd advise that you draw the line at 'Bag of Glue'. Unless you like Rammstein – and if you've never heard of them please ignore this; you'll be better off for it). Korean Shamanism is rooted in ancient folk religions and dates back at least 40,000 years. The shaman has a special ability to make connections as a mediator between the human world and the spiritual world. Most Korean shamans are women and in some cases, they got the ability when they were very young. There are two types of shaman. Some are understood to inherit Shamanic skills within the family, others through a call from the spirit world. Shamans hold a special ceremony (gut) or give a fortune-telling, to deliver good fortune for their clients or heal unidentified illnesses. Traditionally the shamans also hold an annual gut to propitiate gods of the village or locality. Each shaman is a specialist of some kind. Some are good at healing the souls of the dead, for example, while others can predict the future -while others again are good at the yearly ceremony to exorcise the town. The integration of shamanism into daily life in South Korea is reflected in brand communications and popular culture. The image on the right is a famous comedy talk show, where the set design is based on a shaman’s shrine. The host, in costume, plays the role of a shaman and the guest acts as a client seeking a solution to a problem. Shamanism is also a widespread theme in Korean films and teledramas. The centre image was used in Compaq computer advertising some years ago, supporting the claim that the functionality matches that of a shaman. Odd as this may seem as a hi-tech metaphor it signals the strength of continuing belief in the power of the shaman – unlike corresponding ‘magic’ hi-tech metaphors in the West, Korean shamanism in this context is still connected with a culture that maintains literal belief in the underlying spiritual forces. For anyone unaware of this living connection with Shamanism, in the country Koreans see as the original home of shamanism, one of the most surprising expressions of this cultural phenomenon will be the small-ads offering shamanic services. These are common and particularly in evidence in magazines targeting women of middle age. The message in one of these advertisements below reads “The shaman and exorcism are like diagnosis or surgery for your spirit. If you find a good doctor you can get good treatment. So it’s really important to find a good shaman”. In the hierarchy of specialisms, one of the things people clearly want to solve most through a shaman is the secret of material and wordly success. The shaman is the mediator or agent to satisfy such desires. The list of problems people want to solve through a shaman leans significantly in this direction. The shaman is a mediator (or an agent) to satisfy these very practical ambitions. Here certain questions and uncertainties arise. It is in a way covetous to go to shaman since, as Koreans tend to believe, the shaman can see the future and so perhaps change it to be as a client wants it to be. There is something perceptually unrighteous and shady about this because people also understand that their future is their responsibility, something that's being made by themselves. This ambivalence means that the shamans’ advertisements are normally located in places like the last few pages of magazines or the back of the seat on night buses – like these advertisements in the illustration above. This is also a highly commercialised activity, however much its origins are oriented towards the spiritual. There are no free shamanic services. This is a job, a drive to sustain business for the shaman and his/her divine backing. 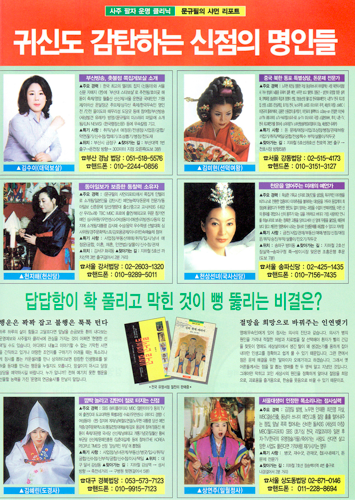 In the pictures in the Korean advertisements, the shamans wear elaborate make up and vivid colour costumes to attract attention – this is a kind of mainstream marketing. Koreans tend to go to a shaman when they have a problem they’re not able to deal with for some reason and need to try to find an alternative possibility for now. Although shamanism is deeply rooted in traditional culture and still very much alive today, most Koreans don’t completely trust the shaman’s ability. However we strongly believe that through the mediation of shamanism it is possible to get, at least, solace of soul and some alleviation of desire. Cognition and semiosis (meaning produced or communicated through signs) are mainly studied by two independent fields – cognitive science and semiotics. Cognitive science investigates mental processes and spans topics such as learning and memory, numerical reasoning, judgment, decision making and more recently affective processing. The bread and butter of researchers studying cognition consists of controlled experiments using quantifiable measures such as reaction time (the elapsed time between the onset of a stimulus and the subsequent behavioural response) and neuroimaging studies to understand cognitive processes at the level of brain activity. Semiotics, on the other hand, is the study of communication, signs and sign processes. Cognitive semiotics, the brainchild of these two disciplines, is taught and researched at, among other places, the Center for Semiotics at Aarhus University, Denmark, which is closely affiliated with the university’s Center of Functionally Integrative Neuroscience (CFIN). Here I completed an MA in Cognitive Semiotics. The discipline investigates meaning in general and explores, among other things, metaphors, categorisations, aesthetic cognition, narratives, and the neural processes causally implicated in semiosis. It also looks into how meaning is greater than the sum of the parts of cognition and semiosis, as entirely new emergent properties appear at the level of meaning that are not easily predictable rearrangements of the underlying cognitive and semiotic processes. Although my own approach to cognitive semiotics relies heavily on quantitative approaches to the study of meaning such as statistical modelling this is not representative of cognitive semioticians in general. There are many views of what constitutes cognitive semiotics and as yet no single overarching paradigm. Traditional semiotics takes a macro-level view of meaning, in many cases relying on desk research. Although cognitive semiotic analysis may be undertaken in a similar manner (with additional insight applied from cognitive sciences), such analysis is usually applied to how humans encode and decode meaning as a micro-level phenomenon – without attempting to draw conclusions about higher-order cultural phenomena. These two perspectives may, however, also be complementary as, used in conjunction, they enable a holistic understanding of meaning, which has academic and commercial applications. I will offer a glimpse into a practical application of a cognitive semiotic perspective here by looking at what’s called the peak-shift effect. This is a well-known psychological principle, originlly discovered during experimental studies of discrimination learning (learning to make different responses to different stimuli). Imagine a rat is trained to discriminate between a 1×1cm square and 1× 2cm rectangle as a result of being rewarded whenever it is shown the rectangle. After some training, the rat will have learnt to respond to the rectangle more frequently. Now imagine that the same rat is shown the same square (1×1cm) and a slightly different rectangle (1× 3cm). To which rectangle will it respond more favourably (the 1× 2cm or the 1× 3cm rectangle in relation to the 1×1cm square)? Have a think. I hope you thought the 1×2cm rectangle would be favoured, given that the rat was trained on this rectangle. Surprisingly enough, that is not the case! In reality, the rat would respond more frequently to the longer rectangle (1×3cm). The rat responds more favourably to an exaggerated version of the training stimuli. The rat has not learnt to favourably respond to the actual rectangle used during the training, but it has learnt something profoundly more sophisticated. It has learnt an abstract rule of what constitutes a rectangle. The longer rectangle is more rectangle-like for the rat’s cognitive system. According to Vilayanur S. Ramachandran, eminent neuroscientist and director of the Center for Brain and Cognition at the University of California, San Diego, the peak-shift effect is fundamental to understanding much of visual art, for example, how artists unconsciously encode the ‘very essence’ of something using the peak-shift principle (see Ramachandran & Hirstein1999 for an overview). Here is an example of the peak-shift effect using the caricature of Albert Einstein. According to Ramachandran & Hirstein (1999), a caricature is created by unconsciously taking an average of all faces, subtracting this average face from Einstein’s face in order to maximise the difference between Einstein’s face and an average face. A skilled artist then amplifies this difference even more to create a caricature of Einstein that is more Einstein-like than a photograph of Einstein. The reason being that the caricature resembles accentuated features of Einstein’s face (e.g., hair, nose and eyes). In the jargon of neuroaesthetics and cognitive semiotics, a well-crafted caricature of an individual becomes a superportrait as it is usually better recognised than undistorted images of the same person. 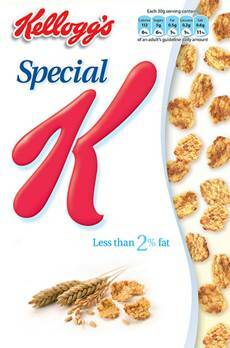 Cognitive semioticians have used this particular effect for investigating meaning encoded in cultural artefacts ranging from Renaissance paintings to brand logos or an on-pack illustration effect such as the Kellogg's Special K cereal box’s exaggerated female hourglass shape, further enhanced strategically by being placed at the edge of the box. Once you are familiar with the principle, you will see, hear, taste, feel and smell peak-shift effects everywhere in popular culture. For an olfactory example, walk into the fragrance section of your local shopping centre during your next visit and sample some of the flowery perfumes – or the piped in fresh baking smell the extends far beyond the bakery section in any major supermarket. The peak-shift effect is a universal and taxonomically widespread phenomenon, and it both moderates and mediates communication by exaggerating specific meaning effects. This is simply one principle that accounts for exaggerated meaning effects; however, meaning in general is usually influenced by numerous such principles, interacting with each other in unique ways. Cognitive semiotics provides a unique evidence-based framework for better understanding the nuts and bolts of meaning. Ramachandran, V. S., & Hirstein, W. (1999). The science of art: A neurological theory of aesthetic experience. Journal of Consciousness Studies, 6, 15—51. You are currently browsing the Semionaut blog archives for April, 2011.